Elon Musk’s SpaceX is planning to launch two satellites on Saturday to test low-latency satellite broadband it hopes will eventually cover nearly the entire globe. Following an impressive test of the Falcon Heavy vehicle just last week, SpaceX is now moving forward on a plan to provide broadband to the whole world. The ‘Starlink’ service will undergo initial testing on a pair of compact sats with the catchy names of ‘Microsat-2a’ and ‘Microsat-2b’. 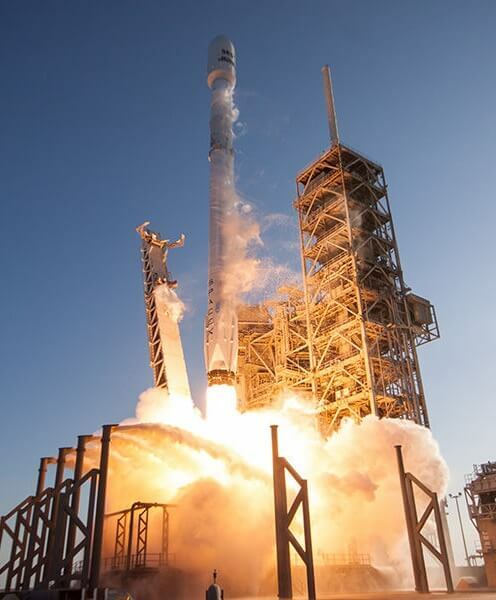 SpaceX hopes to eventually provide global coverage with a huge network capable of offering speeds up to 1Gbps. Satellite broadband has a major advantage over fixed line and wireless broadband using planetside transmitters: it can deliver internet to any location within its footprint. That makes it ideal for covering areas that lack conventional broadband. As well as serving rural locations in countries that otherwise have good fixed line connectivity, it is potentially game-changing for developing nations. What makes Starlink different to existing satellite broadband providers is its goal of very low latency connectivity. Satellite broadband services suffer significant delays in communication as the signal travels back and forth into space, making satellite unsuitable for tasks which rely on very rapid data transfer. But Starlink will operate in a low earth orbit (LEO) at an altitude of 1,110km to 1,325km, far less than the (approximate) 35,000km altitude of many other broadband satellites. This will drop latency down to just 25-35 milliseconds, comparable to a fixed line service and far quicker than the hundreds of milliseconds currently experienced with satellite broadband. The drawback of this approach is that each satellite covers a much smaller area, which is why SpaceX plans to deploy up to 4,425 of them. The price of achieving this lofty goal is less of an issue thanks to its Falcon rockets lowering the cost of getting stuff into orbit but there is already concern about the growing amount of space junk that puts satellites and spacecraft at risk, and Starlink will add a significant amount of extra clutter. In order to receive Starlink on the ground you will need a receiver dish, which ISP Review says will be “the size of a laptop”. It’s hoped that the first customers will be online by 2020, with the aim of the entire network being completed by 2024.